The phone has a better camera than the Note 8, with a dual 12MP rear setup that has a dual-aperture technology, and can record Super Slow-Mo videos. There are stereo speakers and AR Emoji at back with some finer avatar customizations. The mobile features new S Pen which is capable of performing Bluetooth-connected magic tricks from up to 30 feet away. It also charges quickly while embedded in the phone. Besides, it also features a powerful battery of 4,000mAh capacity. This is the best Samsung phone you can buy when it comes to battery life. The Samsung Galaxy Note 9 is launched in India. The mobile features a 6.4-inch display with a screen resolution of 1440 x 2960 pixels and runs on Android v8.1 (Oreo) operating system. As far as the battery is concerned it has 4000 mAh. Over that, as far as the rear camera is concerned this mobile has a 12MP+12MP camera. Excitingly, the fingerprint sensor is built directly into the screen. For graphical performance that can make games run smoothly, this phone has got a Mali-G71 MP20 GPU. The handset is available in Marble White, Walnut Red, Midnight Black, Maple Gold, Orchid Grey and Deep Sea Blue colors. The smartphone features a 6.4-inch display with a screen resolution of 1440 x 2960 pixels. Display type is of Super AMOLED 4K. The smartphone makes use of an octa-core Qualcomm Snapdragon 845, coupled with 6/8GB RAM and 128/512GB default memory capacity. This storage can be expanded up to another 512GB with the help of a microSD card. For imaging, the mobile sports a 12MP + 12MP dual camera with digital zoom, auto flash, face detection, touch to focus, continuous shooting, High Dynamic Range mode (HDR), Geo Tagging. Up front, the smartphone from Samsung makes use of an 8MP selfie camera. The connectivity aspects on board the device include wifi 802.11 a/b/g/n/ac, dual-band, wifi direct, hotspot, v5.0, A2DP, EDR, LE, v3.1, Type-C 1.0 reversible connector, with A-GPS, GLONASS, BDS, GALILEO. The smartphone packs a non-removable Li-Polymer 4000 mah battery, with quick charging technology. It runs Android 8.1(Oreo), out of the box and will get the Android 9.0 (Pie) update in coming months. The fingerprint present in the screen works faster and secure. Other sensors include a light sensor, proximity sensor, accelerometer, compass, and gyroscope. 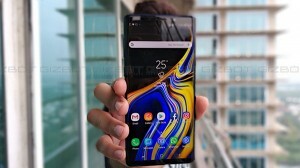 The Samsung Galaxy Note 9 price in India starts from Rs. 67,900 for 6GB and 128GB variant, and Rs. 84,900 for 8GB and 512GB variant. Samsung Galaxy Note 9 new firmware update rolling out with April security patch. The update released for the Galaxy Note 8 carries a firmware build number N960FXXS2CSD2. Samsung is planning to include a built-in optical zoom camera on S Pen for taking selfies. Here is what the patent reveals about the plan. Samsung Galaxy Note 9 scores Android 9 Pie update. The latest Android Pie update for the Galaxy Note 9 brings along the usual Android Pie goodies with it such as the dark mode, adaptive brightness, and others.